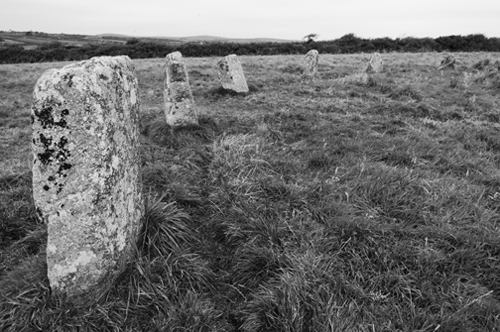 Martin continued his project begun on the Isles of Scilly, capturing images of neolithic remains and ‘land marks’…. It was good to have a specific focus for the time spent at Brisons Veor. I had a list of sites I wanted to visit and photograph, and an idea of how to tackle them style-wise in different weather conditions, so I was able to concentrate on getting on with the actual work. I photographed an average of two sites a day, which meant I got to all the ‘must sees’ and some additional ones.The forward planning and research of sites was essential to the success of the week, I think, as I could have a good idea of what I wanted to achieve in specific terms. Ideally I would have had some sunrises and a better quality of light than the weather provided – it was drizzly and misty most of the time – but the mist added some good atmosphere to the more remote sites. I was photographing primarily with black & white film, as I am inclined to do for my personal work, though I made digital versions of most of the photographs at the same time. 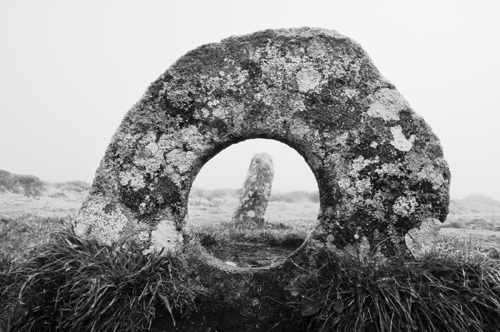 The work will be shown at the Centrespace Gallery, Bristol in May 2013. This will be a group exhibition with nine other photographers, all of whom are current or former staff on the photography course I used to run at City of Bristol College.